You need a retail location for your Prince George business with good traffic, but you also need a place that's affordable. At Majestic, we understand that and we can help you find what you need-a space that is affordable, with flexible lease terms. We specialize in great locations! If you need a large retail location near a busy highway in Prince George, BC, this may be the right location for your business. Parking is second to none in Prince George. Upstairs offices have elevator access. Call 250-562-Rent for more information. 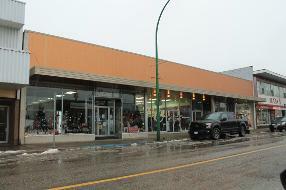 Excellent retail location immediately across from the busy Prince George Courthouse and Farmer's Market. Big east facing windows provide lots of natural light and great exposure. 2,268 square feet of storefront space! Call 250-562-Rent to view it today! Specialty avenue along 4th has a space available. You store could be right next door to Jim's Clothes Closet, "where the quality man shops". Many stores like the high foot traffic volumes along 4th Avenue and the 3 hour free parking for customers. The density of retail stores in this area of downtown Prince George helps bring the right type of foot traffic. Come see how this space might work for your business. Call 250-562-Rent!